Anyone pursuing a fitness program or involved in fitness training for the purpose of weight loss should know about the benefits of fiber in their daily diet. 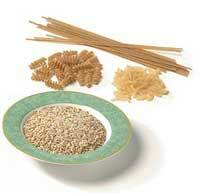 Fiber is a type of carbohydrate which the body cannot digest. Nutritionally, there are many benefits to having an adequate amount of fiber in your diet. Foods that are high in fiber require more thorough chewing, which slows down the eating process which helps to prevent an individual from eating too quickly and eating too much food. Because fiber-rich foods help to contribute to a satisfying feeling of fullness without contributing calories, eating foods with fiber helps to satiate hunger because foods stay in the stomach for a longer period of time. In addition, eating fiber helps blood sugar levels stay on a more even keel because fiber helps to slow the digestive process down enough so that glucose, or blood sugar, enters the bloodstream more slowly and evenly than with other foods. Fiber works with bacteria in the colon to produce organic acids which nourish the colon while the fiber is passing through the digestive tract. The consumption of enough fiber in the diet contributes to overall fitness because it helps to eliminate the risk of diverticulitis, hemorroids and constipation as well as being linked to lowering the risk for colon cancer. Fiber can also help to lower the body’s bad LDL cholesterol levels. The insoluble fiber contained in certain foods promotes quicker and more regular movement of waste products through the colon which not only aids in fitness but also in weight loss. During fitness training, it’s important to include a good variety of plant-based foods in the diet in order to increase the amount of fiber consumed daily. Among the best food sources of dietary fiber when on a weight loss program or during overall fitness training include dark green leafy vegetables, green beans, legumes, fruits eaten with the peels on such as peaches, plums, apples and pears, whole wheat grains and cereals, wheat and corn bran, nuts and seeds. An individual whose daily menus contain a good variety of fiber rich foods tend to take in less calories and feel fuller faster after eating, both of which contribute to weight loss. The recommended nutritional intake for an individual pursuing a fitness goal of weight loss is 25 grams of fiber daily. But individuals who do not have that high an amount in their dietary choices should gradually build up to that level, making sure that their fitness activities include drinking plenty of water and fluids to keep the fiber moving once it has entered the digestive tract.